Fireworks. Rooftop barbecues. Patriotic picnics or pool parties. Sparklers. 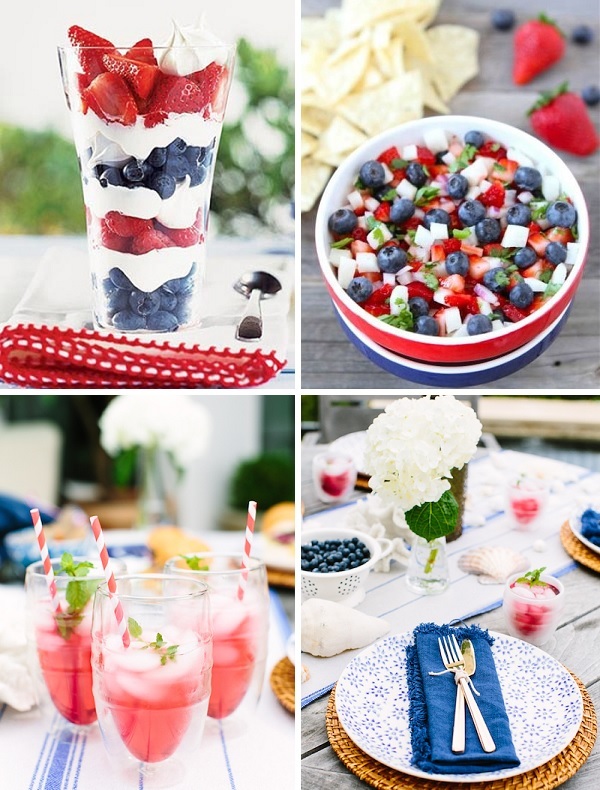 Red, white and blue themed decor and foods. The Fourth of July is a festive celebration that comes in many forms, from the easiest casual get together to a full-on affair. The timeless red, white and blue color palette can carry through in your decor or foods in a myriad of ways; I prefer using my favorite strawberry and blueberry fruits in a variety of foods. The colorful fruits add a festive touch to the table and are light fare for a hot summer day (or night). Keep things simple by rolling up cones of strawberries and blueberries in butcher paper, layer the festive fruits with yogurt for a parfait, spread your favorite crostini bread with cream cheese and strawberries or create a fruity salsa that is just right for this hot summer celebration. Drinks are a must for any party and can have a festive flair with flavored strawberry water topped with mint, a fruit sangria or light mojito. For decor channel a seaside feel with natural plate chargers, light colored dishes, crisp blue and white table linens, sturdy fabric napkins and white flowers. Keep dessert simple with the classic American favorite – chocolate chip cookies. Unfortunately I won’t be participating in this Fourth of July as much as I wish I could (my mom is back in the hospital), but if I could I would implement these ideas. I hope everyone has a fabulous Fourth!